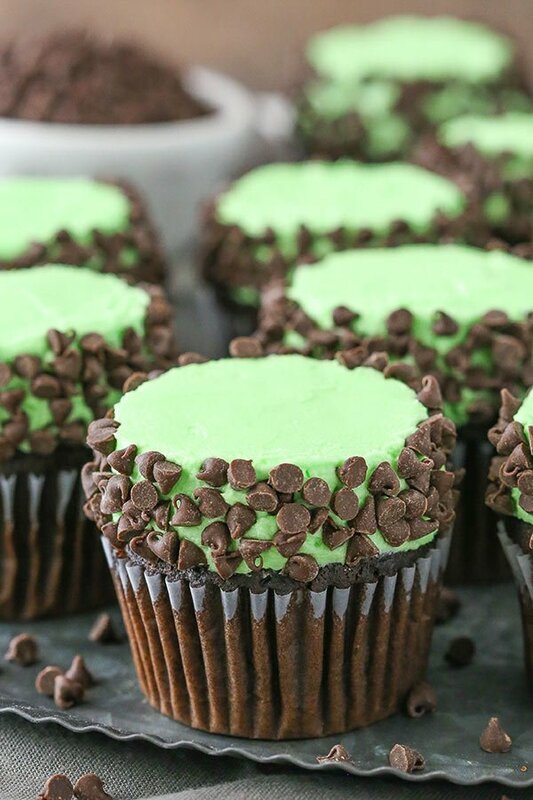 These Mint Chocolate Chip Cupcakes are made with a moist chocolate cupcake, mint frosting and mini chocolate chips! 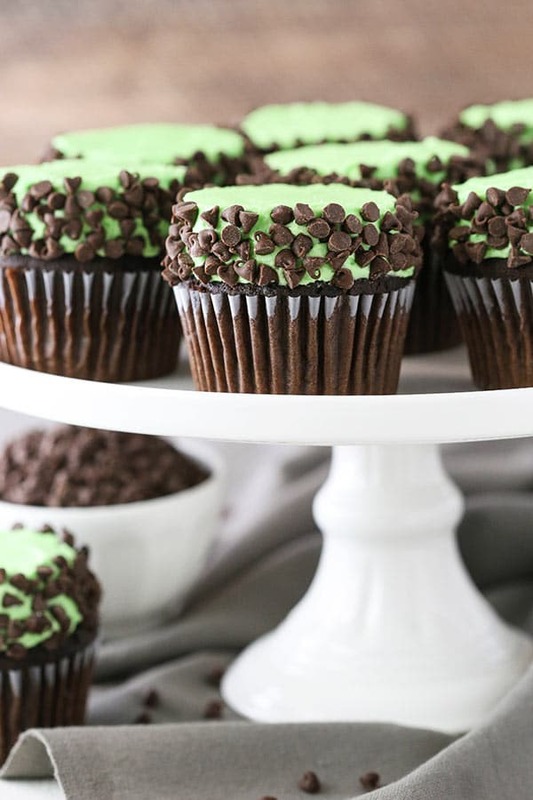 A classic flavor combination in cupcake form! So I am a big fan of music in general. I love jammin’ out and I love to dance, even though I might not really look that great doing it. Lately, music is one of those things I haven’t been able to listen to as much. Now I tend to listen to the sound of baby toys or baby monitors. In fact, the first time I got in the car to go to the grocery store after the boys were born, I heard music that wasn’t a baby toy and realized how much I’d missed it. I turned it up and car danced all the way to the store. Now that the boys are a few months old, we play more than just the music that comes out of baby toys, but that’s still the majority of what we hear on a regular basis. Well, the other day I was washing dishes and humming a tune when all of a sudden the hubs and I looked at each other with matching shocked and nearly terrified looks on our faces. We both realized at the same moment that I wasn’t humming my usual 90s jam, I was humming BABY TOY MUSIC! The horror!! Toy music has officially become so burned into my mind that I hum it. This is a problem that I imagine will not go away any time soon and I’m a little afraid. I must drown myself in these cupcakes, since you can’t have alcohol while breastfeeding. Ha! Speaking of these cupcakes, I’ve been super excited to make them. It was a flavor combination that I wanted to make for the hubs, since he’s always been a fan of other mint chocolate desserts I’ve made. 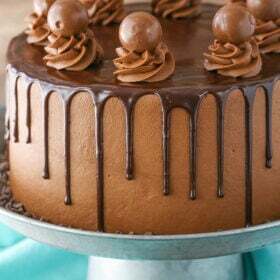 To start off, you’ll make the cupcakes If you’ve tried my Most Vanilla Layer Cake and love it as much as I do, then you’ll love this chocolate version. Moist and soft and such a great butter-based chocolate cupcake with just a touch of oil for some added moisture. Love them! 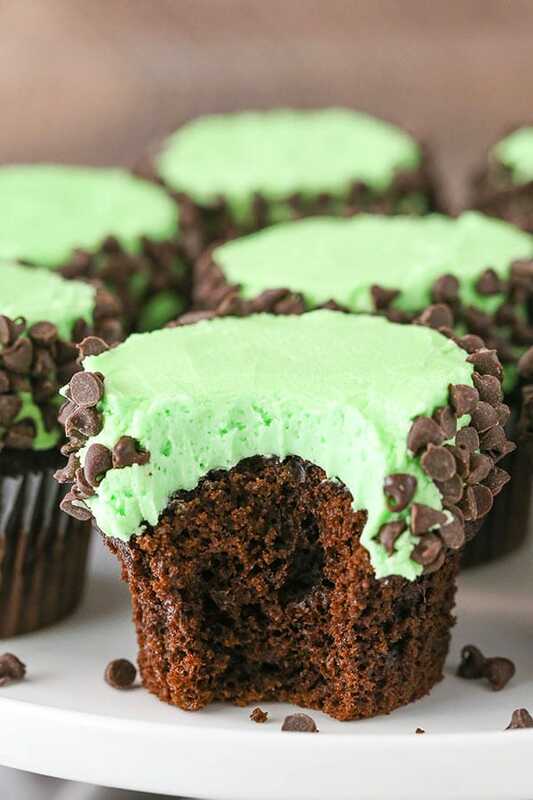 The frosting is mint flavored using mint extract. I also added some vanilla extract and as simple as it seems, the vanilla extract is an important part of the flavor. Mint can sometimes seem a little toothpaste-y. When you add the vanilla, it sweetens up and evens out the mint a bit so that it’s more of that dessert mint flavor that we want. To frost the cupcakes, I decided that I didn’t just want to drop a few mini chocolate chips on top, I wanted plenty of them packed around the edge so that you get plenty of mini chocolate chips in every bite. To achieve this, you want to pile the frosting onto the cupcake. I used a large round tip to add it evenly to the top. It doesn’t have to be pretty because next you’ll use an offset spatula to smooth out the sides and the top. Then, before the frosting sets and while it’s still sticky, dip the sides of the frosting into the mini chocolate chips. I like to hold a few chocolate chips in my hand and dip it that way, but you could also use a small bowl. 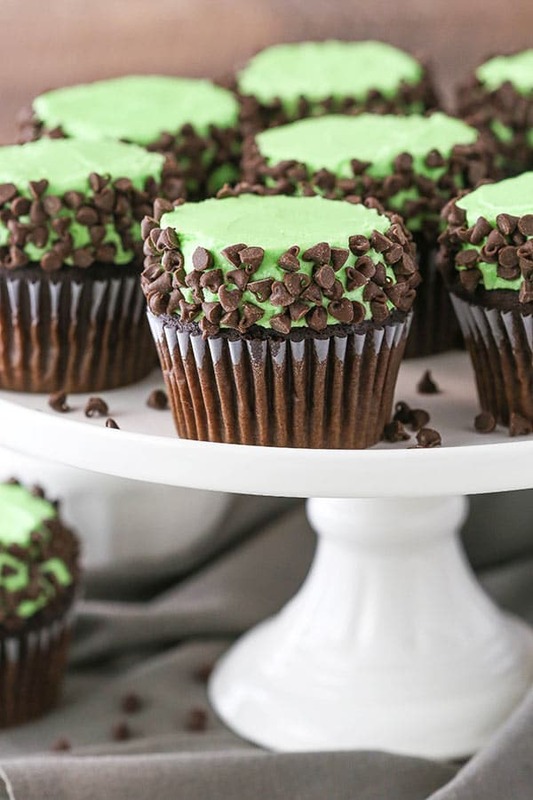 The final cupcake has the classic mint and chocolate chip flavor that I love so much. It just about melts in your mouth, with the exception of the lovely crunch of the mini chocolate chips. We loved them in our house and I hope you’ll love them in yours too! 9. To make the frosting, combine the butter and shortening in a large mixer bowl and mix until smooth. 11. Add the vanilla and mint extracts and 1 tablespoon of water or milk and mix until smooth. 12. Add remaining powdered sugar and mix until smooth. 13. Add remaining water or milk as needed and mix until smooth. 14. Pipe the frosting onto the cupcakes. I used a large round tip to pipe frosting evenly on to the top, then smoothed the top and sides with an offset spatula. 15. Add mini chocolate chips to a small bowl (or hold some in your hand) and dip the sides of the frosting into the chips so that they stick. Lol! I totally forgot about the singing baby toys getting in your head, but it’s so true! After they graduate from baby toys, the next is the theme songs from their favorite kids shows, or pre-school learning songs, bouncing around in your head when you are trying to get to sleep! But truly it is all so short lived, I’m so happy for you guys with your sweet boys! 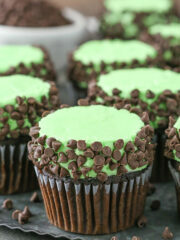 As for the cupcakes, my kids LOVE mint chocolate chip and we will just have to make these!! I love your recipes, every one of them turn out so well! I love your ingenuity with the “flat top” icing! With the color and all of those mini chocolate chips, my first thoughts went to mint chocolate chip ice cream. I love that flavor and texture…and now it won’t melt! I am always so amazed at all of your creativity. And, I don’t even waste my time on anyone else’s cake recipes because I know you have perfected them. As for the baby music, while classical might not be your favorite, there’s a lot of evidence that it creates a comforting environment for infants and can sooth and relax them to sleep. I played (and hummed) it for both my son and my granddaughter and, when still a toddler, we found a “Music Together” class that planted the music seed that continues to grow today. As for the kid’s TV theme songs and those first pre-school songs that Charity mentioned, I still can hear them in my head after all of these years! But, maybe that’s what keeps us grandmothers young at heart! You are so sweet – thanks Lin! So glad you’ve enjoyed the recipes! We actually have a great little toy that plays some classical music. I love the idea of the “music together” class – how fun! Wishing you a very Happy First Mother’s Day Lindsay! 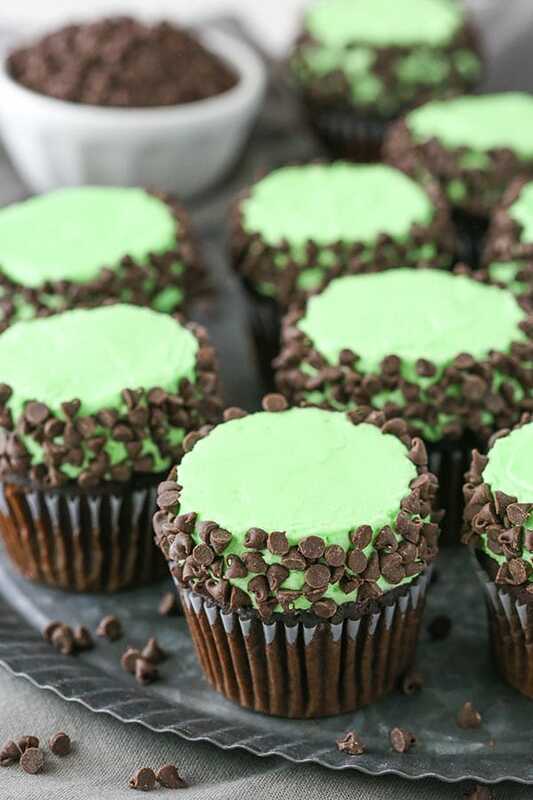 They look great and would love to make them ….but I don’t see how you got the frosting green?? I do not see a green tint in your list of ingredients for the frosting. If you would divulge how much you used that would be great! Looks like a keeper recipe! You are right – I forgot to add that to the ingredient list. I used green gel icing color. It’s tough to say how much, because I just use a toothpick and add small amounts at a time. Do you have any substitutions suggestions for the milk called for in the actual cake recipe? Are you trying to eliminate dairy? Or just all milk? A dairy free milk would be fine. Replacing all the milk with something totally different – I’m not entirely sure as I haven’t tested it, but you could try water, sour cream or a mix of both.